My feelings are that in each family there is one who seems called to find the ancestors. To put flesh on their bones and make them live again, to tell the family story and to feel that somehow they know and approve. To me, doing genealogy is not a cold gathering of facts but, instead, breathing life into all who have gone before. We are the story tellers of the tribe. All tribes have one. We have been called as it were, by our genes. Those who have gone before cry out to us: Tell our story! So, we do. In finding them, we somehow find ourselves. How many graves have I stood before and cried? I have lost count. How many times have I told the ancestors, "You have a wonderful family, you would be proud of us!" How many times have I walked up to a grave and felt somehow there was love there for me? I cannot say. It goes beyond just documenting facts. It goes to who am I and why do I do the things I do. It goes to seeing a cemetery about to be lost forever to weeds and indifference, and saying I can't let this happen. The bones here are bones of my bone and flesh of my flesh. It goes to doing something about it. It goes to deep pride that they fought to make and keep us a Nation. It goes to a deep and immense understanding that they were doing it for us. That we might be born who we are. That we might remember them. So we do. With love and caring and scribing each fact of their existence, because we are them and they are us (For we without them cannot be made perfect.). That, is why I do my family genealogy, and that is what calls those young and old to step up and put flesh on the bones. Children enjoy hearing stories read to them, especially so when they begin "once upon a time". At least that was true some years ago. In most of these stories, one had to use imagination. The one I want to use today also calls for a lot of imagination; however, believe it or not, it is about as close to the truth as I can come. The reason for telling you about these events is to bring back some memories to you older folks and to assure the young ones that "home life" in our younger days was filled with a variety of "doings", out of which came some actual fun and in some ways we were experts in making fun out of some of the work. "Never a dull moment" could come close to being a fact! Well, "once upon a time" back in 1914, the sixteenth child was born into the Mann family who lived in a two-story house on "Pegram Hill"—me! It isn't for me to say, but I doubt if much celebration went on then on that happy October day, and I know for sure NO cigars were passed out! Even so, there is no doubt in my mind about being loved, fed and well cared for, that is until I became big enough to do MY SHARE. In those days it didn't take long. Being fed continued, being loved continued, and being cared for continued, but at a bigger price! It didn't take long to realize what was going on in other ways either, and perhaps that's what I'm remembering best. For instance, on Sunday morning, if we were to have fried chicken for dinner, it had to be chased, caught, killed, dressed and cooked. Guess who did the "chasing"? JOYCE! I helped, but she could out-run a jack rabbit. All water was brought in from a very deep well, with a winding apparatus known as a windless—carrying one bucket down as it brought one bucket of water up! On week days that "water-boy chore" was quite a job, especially on Mondays—WASH DAY! The custom was, "bathe lightly". If a BIG weekend was supposed to be upcoming, we used the wooden tub known as the "wash tub". Well do I recall the home folks coming back to visit on weekends and sometimes in between. My elder brothers, Lemmie, Raymond, Clarence and Benona, my older sisters, Berta and Maude, each had children near my own age, and that it made it all very wonderful. They came often and were always welcomed. Knowing what to play was never a problem. Old Kate, the mule of the day, was one of our favorite "toys"! She was gentle and patient, and we rode and rode, two at a time, sometimes three. Then we had a big barn for hay and in this barn was a deep rack filled with wheat straw for the cows. It made an ideal jumping spot! It was a favorite pastime for everybody to jump in, crawl out, again and again. Tiredness was unheard of. Also, we owned a two-wheeled cart, Chinese style, made by Mann Manufacturing Company. In fact, we had quite a variety of vehicles around. This model was a dandy, the only hitch was to find one "willing worker" to pull it so as to ride! On one occasion we used one of the calves. I happened to be a rider and hung on the shaft all along as the calf ran away down a long bumpy hill. It was near time for me to quit growing and that is what did happen, at least for a time, because of how frightened I was, and rightly so. My observers can verify that it wasn't the safest way to travel. Ballgames were regular events, also tree climbing, horseshoe-pitching, swinging high in long wooden swing (one that extended across the road from a large tree), chase spy, hat-in-the-hole, and many out-dated perhaps, but amusing pastimes were our free-time activities. Brother Buck could tell you a lot about the buggy guided by the ropes going down that steep hill. As I remember, Sallie was in on most all of the wild antics which Buck and she thought up. Reid was not all that brave, usually, or perhaps valued her life more. Joyce didn't leave much out that they suggested, and it was hard for me to act my age, but very seldom was I left begging. Beulah was older and more willing to help do the house work than some of us. Herbert managed to climb up and stand on the chimney top! How did he do it?? We will have to ask him. Gaither happened to be away at school in some of these days and wasn't married yet; however, I recall how delighted it made me feel to know he was coming home for a while. It seemed too that it was a very special topic of his to mention a girl named "Maggie", and now we know how "special". It was never said, not really, but I rather think Papa had a feeling about work, "If you eat, work"; and we did eat and we did work, all kinds. You name it, I did it! So did anyone else that happened to be available. Having all these convenient "playmates", or would-be "visitors", was a big help; and they seemed never to mind helping work so we could play sooner. They helped pick up apples in the orchard to make cider, haul pine straw for the mule stable, pick the peas and cotton, pull the corn, dig the potatoes and peanuts, and even consented to doing the milking after going down on Parkers Creek to fetch the cows. Well, it all added up to a busy world, a kind that had its own compensation, perhaps not in dollars, but for sure in delight! Our first reunion stands clear in my mind, for Mama and Papa were the ones that made all the plans. Maybe my age was about ten; at any rate, I wasn't grown-up yet, but not small. Papa wanted to give the children a good time, and to do so built a huge enclosed frame with seats to fit the two-horse wagon. Bob and Kate were the "engine" to this 4-wheel train, and Papa must have had about 59 children to go on that ride—Joyce and I were along, too. Not a one was insured that I know about, but good old Kate and Bob were dependable and loved their "driver". The trip was safe, and WHAT A MEMORY! The seats for the yard, however, were a big disappointment, I think. Papa had thought up the sly use of stove-wood blocks; and when it came time to sit, the blocks had turpentine resin leaking out each end. So, mostly we sat elsewhere, or stood, walked or otherwise. Ice cream was brought in by Charlie, then working at Pine State Creamery: 5 gallons vanilla, 5 gallons chocolate, 5 gallons strawberry! It was plentiful! It was good! TOO PLENTIFUL! TOO GOOD! To this day I don't especially like vanilla—no more. I overdid it. Homecoming may have been the proper word for that occasion; but at my age, it seemed more like a super picnic! FOOD! FUN! FROLICKING! FELLOWSHIP! It was quite an occasion! Just wish I could flash on screen for you to see the action mentioned in those years and much more. Remembering it all as I do, you would think some of it would have been unpleasant or regrettable. I am sure much of my life had some of those moments, yet it seems to have faded completely, leaving for me, as it does for many of you, a feeling best described as grateful for my parents, thankful too for my childhood life with such a big, wonderful family, and glad—very glad—that the memories remain. Let's say it was maybe about the year 1850 that John Mann came to a definite conclusion that he would like to take for his very own, a certain lovely lady, Candace Upchurch. John and Candace were wed and soon there was a born a boy whom they named Fred. In a short while, another boy arrived in their home. In my imagination of this very "special fellow, seems I can't select the right adjectives to describe this second arrival. Can you visualize what your Father, your Grandfather, your Great-Grandfather, your Great-Great-Grandfather was like when he was a baby? Yes, I'm speaking of Lindsay Sanders Mann who was born May 25, 1855. Don't you think he was a bit small in size, bright piercing eyes, full of vim, vigor and vitality, and a chore for his mother to keep up with? Yes, I can visualize him as such. I due time Lindsay grew to that interesting age, "The Girl Liking Age". Now over a short distance from this house was a sweet, pretty, round-faced little girl named Rebecca Holt. Her beautiful black hair was just too much. Lindsay went after Rebecca with that determination that he was filled to the brim with. So Lindsay, age 23, and Rebecca, age 17, were married January 2, 1878. And here we will say a vineyard was begun. Exactly one year, lacking one day, the first little plant came to life in this vineyard—except this was not a plant. It was Lemuel Chester Mann; 22 months later Johnnie Mann arrived; 23 months later a girl, sweet dainty Roberta Lee, to us she was Berta; 22 more months and handsome Raymond Harvey joined the happy family; 27 months later another girl was born, Malinda Florence; 23 months later, a big bouncing boy arrived, Benona Sanders; 27 months later Hannie Clarence was born; then Ella Maude; 23 months, then Gaither Clayton. No, that was not all. Planting time was still carried on. Three years and four months later and making addition number ten, Herbert Lindsay arrived. Eight months later tragedy struck this lively, fun-filled home when Mother Rebecca was taken away. Help! Sure help was relished and needed by Papa. Ten children, ages 8 months to 20 years. Other than the complete necessities for all these children, there was something else very important needed: companionship. Let's travel a little now in our thoughts. Over in Ireland, a boy John had grown up, John O'Connell. John was not just like other boys in his small town, or surrounding area, his country. He had a will of his own. He not liking and not being able to accept the girl that had been chosen for him, as was the custom in that family, John decided to do some selecting of his own. This he did in a far-reaching way. Now, John O'Connell did not have money, but he did have a strong will. So in secret, he boarded a ship that was sailing for America. I can imagine he had heard about America, that great and free country, flowing with milk and honey. I don't know how long it took him to cross the Atlantic Ocean or where he touched land, nor how he arrived in North Carolina. But in some way he got here and found and married Martha Johnson. On the last day of the last month of the year 1874, Mattie Irene O'Connell was born. I'm sorry I don't know, for I think it would be very interesting to know, when and how Lindsay S. Mann met or when he first became interested in the little blue-eyed, dark-haired Irish girl, Irene O'Connell. But our records state that Lindsay, age 45, and Irene, age 25, were married December 19, 1900. And naturally, the vineyard continued to be added to. In November 1901, a baby girl, Beulah Maybelle was born, thus making the 11th addition to this vineyard that was begun back in 1879. Two years later, another girl, Sallie Ethel, arrived. In October 1905, which was three years after Sallie's arrival, Garlon Olander, "Buck" as we always called him, came to the scene. Now to Papa Lindsay, this was just another boy, his eighth to be exact. But to Mama Irene, this wasn't just another boy, it was her son, her very first son. Of course, he was something "special". Almost three years passed and little, dainty Fannie Reid arrived. Some of her sisters accused her of being prissy; well, those of you who were around know she could step kinda prissy like. You know, fast, quick, short steps. Oh well! She's a sweet priss. No, this vineyard is not complete, yet. Three years later there arrived a three-pound, dark-skinned bit of something with lots of black hair. They say this something looked like a rat. But it wasn't a rat, it was, yes, it was Mary Joyce. I'm glad they decided to keep me and not throw me back because I was too little to save. Two years later a ten-pound girl made her appearance. A cut over that three-pound job, I will say. Sadie Ellen she was. Often times the best is saved until the last. Now it would never do for me to begin naming who is best. I would just have to say all 15 are. And I'm pretty good, too, so I guess I will have to say all 16 are the Best Bunch of Younguns that there was. Speaking of Sadie Ellen, even though I had a two-year start on her, she about had me in many ways when she arrived. As we grew up, where you saw one, you saw the other. One black and one white, heads that was. And sure there was a lot of competition going on. I could out wrestle and out run Sadie, but let me tell you, she could surely out throw me when it came to throwing rocks. Yes, on that rocky hill, we had not trouble getting our hands on a rock. And sure, we threw rocks at each other. Well, I could out run Sadie, but I wasn't so good at outrunning her rocks. And if she threw one, I well knew I would get hit. "Dead Eye". She just didn't miss. Gee! Didn't we and don't we LOVE each other? My, how this vineyard has grown! 1924 ⇔ The first Lindsay Sanders Mann Reunion was held June 1924 at the home of Mattie Irene O'Connell and Lindsay S. Mann on what was known as Pegram Hill. Lindsay and Rebecca Catherine Holt had moved there sometime in late 1896. (600 acres of land). Rebecca C. Holt Mann died (10-31-1899) 3 years after moving to Pegram Hill. Pegram Hill was named for George W. Pegram, a judge, who built this home in 1842. On December 19, 1900, Lindsay (45 years old) married Mattie Irene O'Connell (26 years old). 1925-1929 ⇔ We assume the reunions were held at the homeplace until Grandmother Mattie Irene O'Connell died on November 3, 1929. 1930-1936 ⇔ We are not sure where the gatherings were because Grandpa auctioned off the household goods and the place was sold. He and the youngest two children lived with various immediate family member. He died December 21, 1936. 1937-1945 ⇔ The reunion was held at different places, but we do not know the order. They were held at Pullen Park, Uncle Benona Mann's, Fuquay Park, and once in the Gold Leaf Tobacco Warehouse, we believe in Varina because it was raining. 1946-1947 ⇔ The reunions were held outdoors at Aunt Maude Mann Dewar's & Uncle Carl Dewar's home. (1946 was when the military guys returned from WW II.) Pictures were made from the side of the Dewar house in 1946 and in front of the house in 1947. 1948 ⇔ The reunion was held outdoors at Sallie Mann Abernathy's & Wilbur Abernathy's home. 1949-1950 ⇔ We think the reunions were again held at Aunt Maude and Uncle Carl Dewar's home. 1951-1956 ⇔ The reunion was held at various places as mentioned before. 1957 ⇔ Photographs were made at this reunion. 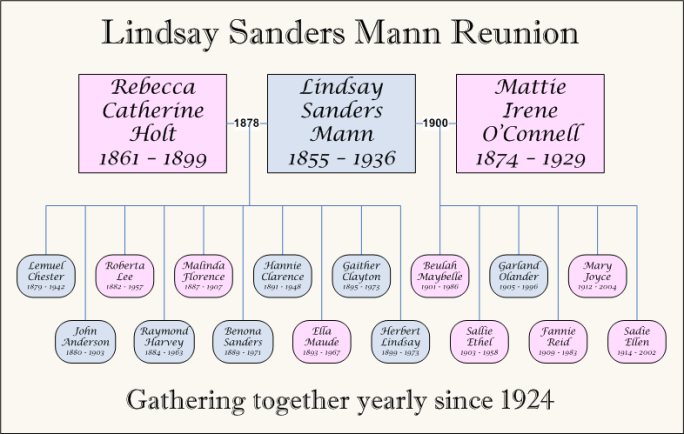 The Lindsay S. Mann Reunion was held at the Fuquay Park and included his brother James Frederick Mann's family ("Uncle Fred"). Cousin Raymond Mann stated that one family gathered in one area and the other family gathered in another. They did not seem to mingle much as he recalled. 1958 to present day ⇔ The Mann Reunions have been held at Cokesbury Methodist Church on River Road outside of Fuquay-Varina since 1958. We assume this is because it is near the homeplace and where they went to church. NOTE: This information was compiled by Lynda Abernathy Miller, daughter of Sallie Mann Abernathy, and presented at the 2005 Mann Reunion. I'm trying to do a little genealogical research, and stumbled upon your page. My branch of the Mann family is from Carteret County, North Carolina. I've been able to trace it back to my great-great grandfather, William Holland Mann, but can't find out who his parent were. I'm hoping you have more information. Please contact me if you can tell me more. My Mann family are from Stanly County. My ggg grandfather Henry Mann was married to Marth Holt and both are buried in Stanly Co at Mann Burleson Cemetery. I believe his father was Malachi Mann who was married to Jennie Jane Underwood in 1774. I have been unable to trace the origins of Malachi Mann but suspect he comes from one of the Mann family lines in North Carolina. There is a reference to him as Capt Malachi Mann in the Rev War in an Edgecombe Co unit but that is where the trail goes cold. I wondered if you had ever heard of a Malachi Mann from one of your branches. I am trying to locate a Wilma Berry Mann. She was born in my hometown of Corbin, Kentucky and married a Charles Mann. She has done some writing found with the John Birch Society. My father has asked me to see if I can find any information on her. He would like to speak to her in regards to re-publishing an article which he found in a 1987 publication. Thanks for sending me the 2009 Mann Reunion Postcard. It made me pick up my dusty files again and I hope to make the reunion this year. I used to come with my grandmother, Mamie Mann, mother Dora Mann Dobbins, aunts, Francis Mann Willett, Jeanette Mann Payne, and Helen Mann Graham but it's been a while. Now I see Uncle Tommie and his family and cousin Bobby Payne came in 2008. Terrific! Thiis is such an incredibly great website. I will have to keep checking it out. Please keep me posted. My own family is starting to spread now - oldest daughter just got married.